Preserve live PowerPoint presentations for viewing later by anyone, anywhere. 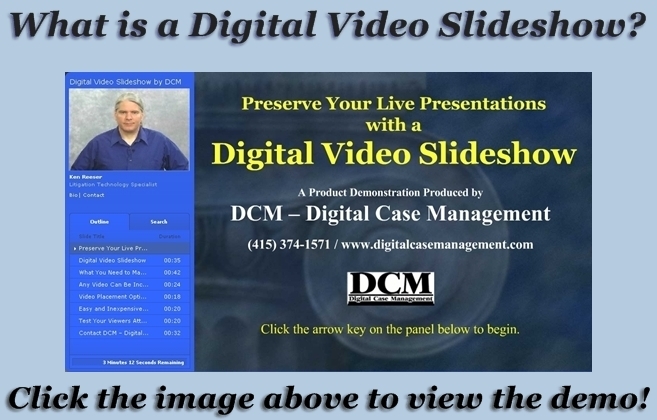 DCM - Digital Case Management solves your slideshow presentation problems with our Digital Video Slideshow. A Digital Video Slideshow (DVSS) is an interactive digital document that combines a video recording of your presentation with your PowerPoint slideshow into one user-friendly document. It can be put on a website — public or secure — or delivered as a stand-alone file. It is viewable on any web browser or by the standard Adobe Viewer application. A DVSS places a video recording of the presenter in a window above and to the left (or right) of the slide. The slide includes all the graphics, video, audio and animations from the original. Each step or action of the slide is timed to the appropriate point in your recorded presentation. Viewers can scroll back through the video, review each slide at their own pace, go back a slide or advance to the next slide when they’re ready. Problem: You have a class-action lawsuit and need to present the testimony and research of a half-dozen experts in various locations to dozens of other experts, arbitrators, parties and legal staff, also in various locations around the state or country. Solution: Create a DVSS of each experts' presentation of findings, load these onto a secure server, and have everybody view them at their own desk, on their own time, and get the settlement talks started. Oh, and save a lot of money in travel expenses. You can attach documents, pictures or other files to the slideshow for the viewer to download. You can also add a quiz or survey and record the results with your AICC, SCORM or Adobe Connect Pro learning management system. Please check out the Digital Video Slideshow demo to see how it works. Contact DCM - Digital Case Management for more information about this useful service, or to schedule a videographer for your next presentation. Have us record your live PowerPoint presentation and create an interactive digital document for your library or archives. Allow your audience easy access to your full presentation at any time. Click above to learn more.